No one can underestimate the subversive power of art. Stories told through art challenge us to imagine the lives of people far away from our own, and ask us to experience our common humanity. For this reason, art and storytelling plays an integral role in our work as campaigners to uplift human connection, to bring about social change. This year, 2017, marks five years since the launch of the Global Campaign to End Child Immigration Detention. 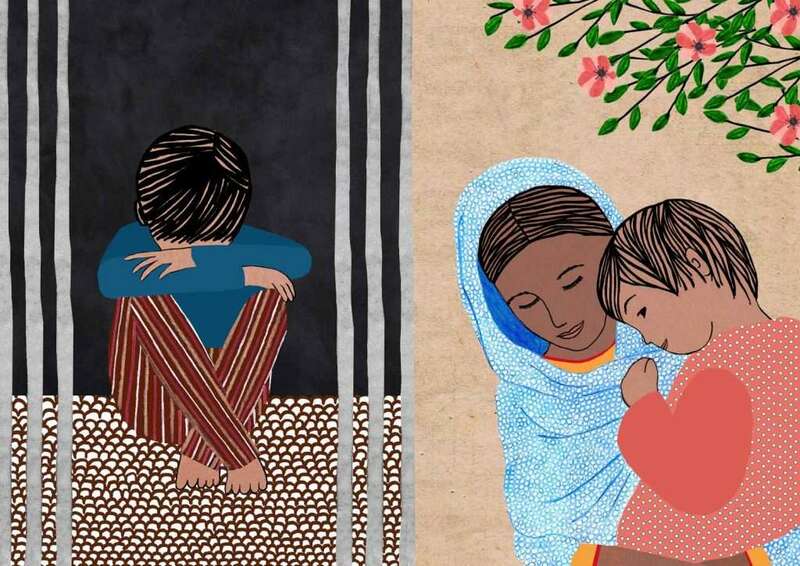 As part of our five year anniversary commemoration we have created a virtual gallery of artworks that tell the powerful stories of children on the move. 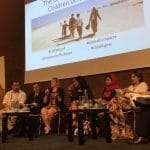 The pieces share the painful experience of children in detention, as well as the possibility of freedom and childhood in alternatives to detention. These artworks help to emphasize the struggle, strength, resilience, and courage of children all over the world who are faced with detention and trauma as part of their life story. For me, all art contains the possibility to transcend borders. By asking artists who live in Europe and Australia to respond to the stories of child migrants we oppose a system of exclusion. Yes, these stories are heart-rending on their own, but I hope you will agree that this art adds a compelling visual component. These are, after all, hybrid artworks and they challenge the cultural fusion that is denied by keeping migrants in detention. For instance, when Manon’s playful style plays homage to Syrian culture by using Islamic inspired patterns. Art helps us bring down the walls that have been put up between children in detention and broader society. Through listening and understanding their experience, we bear witness and we can then bring deeper integrity and commitment to social change. The art challenges the inhumane treatment of children on the move: they are sympathetic rather than suspicious, playful rather than frightening, and, most importantly, have the power to create connections between children living on the margins and the society they are hidden from. I have now had some time to spend with these stories to take them in and hopefully I have come up with some art that can honor the histories of these children. I knew right away that literal portrayals of what happened could never do justice or even come close to describe what these experiences must have been like in real life. I have chosen to make surreal watercolor paintings that try to capture specific moments of the journeys, experienced in a dreamlike state which I can imagine memories feel like now. We can see this when Yusuf’s despair becomes a melancholic blue overwhelming the painting. Or, as Sergio reaches the borderland between the USA and Mexico his courage is a bloated American flag. Thank you to the artists who created these powerful pieces: Filippa Edghill, Manon De Jong and Nani Puspasari. And deep gratitude to the children who shared these stories. They will continue to drive the movement to #EndChildDetention.